This is the second painting for my systematic theology paper. 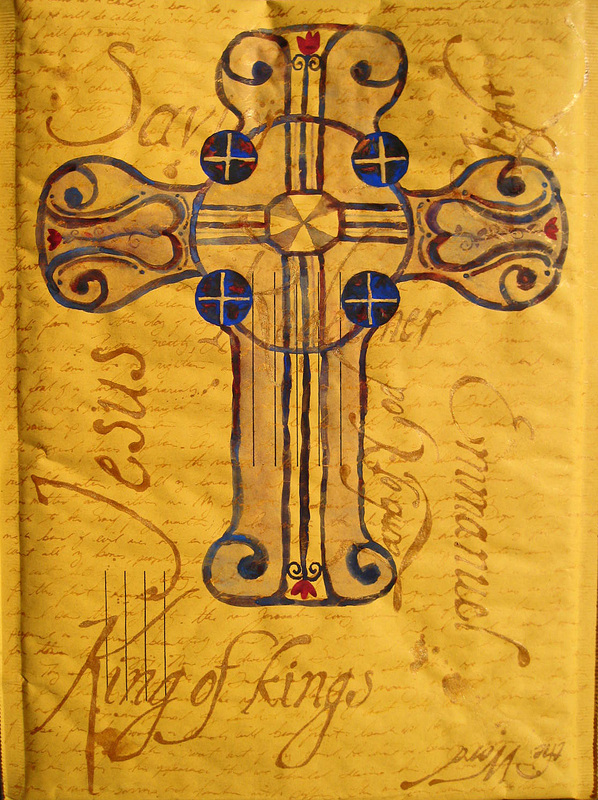 The second Person of the Trinity, the Son, was painted on a smaller envelope than the Father to symbolize the submissive relationship the Son has to the Father (John 8:28-29; John 6:38; I Cor. 11:3). 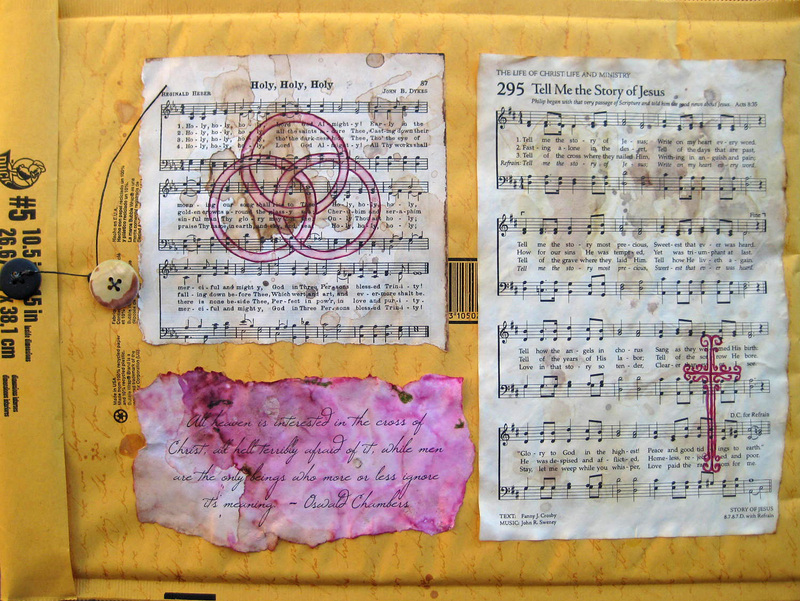 I will be placing the Son envelope inside the Father envelope to further symbolize this aspect of the Trinity. The scriptures I placed in the background in gold are all prophecies of Jesus’ birth, ministry, death, resurrection, and His second coming (Gen. 3:15; Psalm 22:14-18; Isaiah 9:6-7; Isaiah 53; Zechariah 9:9; Isaiah 40:1-5; Psalm 16:10; Isaiah 7:14; Psalm 110:1; Isaiah 50:6; Micah 5:1-2; Isaiah 11; Isaiah 61:1-3; Revelation 21:1-7). These would be great to save and read during the Christmas season to reflect on Christ and what He did for us. The names of Jesus I used were: Jesus, Savior, the Light, Lamb of God, Redeemer, Emmanuel, King of kings, and the Word. The picture I painted was the cross to represent what He came on this earth to do for us – die for our sins. I placed a red flower on the places where His wounds would have been on the cross to symbolize that it’s by His wounds we are healed. WOW Sandi! This is Amazing! I love it! This is awesome! I sang “Tell me the story of Jesus” as a young GA at our little church in East Tennessee. It is a wonderful song. I hope you are planning to have this painting for sale sometime in the future. I know I already have one of your cross paintings but that one was for Roger’s office. This one I would love to have in my home. God is blessing us through your beautiful work and I thank Him for those blessings. Thank you Barbara! Those that grew-up singing hymns, more than I did, I’m sure are more familiar with that hymn but I had never heard it. I won’t be selling this one – I’ll be giving the whole project to my professor for him to keep – kind of a “thank you” for letting us do such a fun project. I thank Him too, Barbara, for the blessings – He’s crazy good to us! Love you dear friend!